The diagnostic imaging industry is focused on the development of advanced mammography systems using combination technology for the better diagnosis of breast cancer. The increasing prevalence of breast cancer and developing healthcare infrastructure are promoting the growth of the mammography systems for better diagnosis and treatment and improved quality of life of patients. The mammography systems involve low dose x-rays for the early detection of breast cancer. Currently, mammography systems are considered a valuable tool for the diagnosis of breast cancer in hospitals, ambulatory centres, and diagnostic centres to provide cost-effective and highly efficient diagnosis and treatment. Moreover, advancements of mammography systems reduced turnaround time and complexity of diagnosis with detailed analysis of 3-D images. The combination technology provides several opportunities to develop the better 3-D images from different angles, thus providing precise and targeted treatment for the disease. The diagnostic imaging industry is witnessing the growth of mammography systems developed using combination technology. Several diagnostic imaging companies are now indulging in the research and development of digital tomosynthesis systems. Furthermore, the advent of digital systems has enabled the companies to develop digital tomosynthesis system for better diagnosis of breast cancer in denser breast tissues and provide better treatment to remain competitive in the market. The purpose of this study is to gain a holistic view of the mammography system market in terms of various influencing factors, such as recent trends, regulatory requirements, and technological advancements of the market. The scope of this report constitutes a detailed study of the products associated with the global mammography system market across different regions. The market has been segmented into ‘products’, ‘technology, ‘end users’, and ‘regions’. The report presents the reader with an opportunity to unlock comprehensive insights with respect to the market and helps in forming well-informed strategic decisions. The research uncovers some of the substantial parameters that must be taken into consideration before entering into the market. 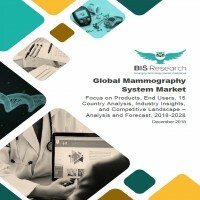 This research report aims at answering various aspects of the global mammography system market with the help of the key factors driving the market, restraints and challenges that can possibly inhibit the overall market growth, and the current growth opportunities that are going to shape the future trajectory of the market expansion. The report includes an in-depth examination of the key players and recent developments taking place in this market. Moreover, the report includes chapters on market dynamics (market drivers, opportunities, and challenges) and industry analysis as well. The research study highlights the factors governing the industry attractiveness with Porter’s Five Forces for a comprehensive understanding of the global mammography system market. Moreover, the study includes detailed product mapping with further sub-segmentation in various countries and in each sub-segment the key market trends, list of the key companies, and the key strategies and developments have been discussed. • What are the major market drivers, challenges, and opportunities in the global mammography system market? • What are the underlying structures resulting in the emerging trends within the mammography system industry? • What was the market value of the leading segments and sub-segments of the global mammography system market in 2017? • How will each segment of the global mammography system market grow during the forecast period, and what will be the revenue generated by each of the segments by the end of 2028? • What are the key developmental strategies which are implemented by the major players in order to sustain in the competitive market? • Who are the leading players with significant offerings to the mammography system market? What is the current market dominance for each of these leading players? • What would be the compound growth rate witnessed by the leading players in the market during the forecast period 2018-2028? • What are the key product types in mammography system market? What are the major benefits of each product type? • How has the market been segmented on the basis of technology? Which technology is dominating the global mammography system market, and what is the reason behind its dominance? • How has the market been segmented on the basis of end user? Which end user is currently dominating the global mammography system market, and what is the reason behind its dominance? • Who are the key manufacturers in the mammography system market, and what is their growth potential? • What are the key regulatory implications in developed and developing regions for mammography system? • What is the growth potential of mammography system in each region, including North America, Europe, Asia-Pacific, Latin America, and Rest-of-the-World? • Which mammography system product type is having the most promising growth and in which region? • Which mammography system end user is having the most promising growth and in which region? The key players who have been contributing significantly to the mammography system market include BMI Biomedical International s.r.l., Canon Inc., Carestream Health Inc., FUJIFILM Holdings Corporation, General Electric Company, General Medical Italia, General Medical Merate S.p.A., Hologic, Inc., Konica Minolta, Inc., Koninklijke Philips N.V., Metaltronica S.p.A., Nanjing Perlove Medical Equipment Co., Ltd., Planmed Oy, Siemens Healthineers, and Villa Sistemi Medicali S.p.A., among others. 9.2 BMI Biomedical International s.r.l. 9.8 General Medical Merate S.p.A.
9.13 Nanjing Perlove Medical Equipment Co., Ltd.
9.16 Villa Sistemi Medicali S.p.A. According to the American Cancer Society, breast cancer is one of the leading causes of death among women. The techniques through which early detection of breast cancer is possible have undergone significant improvements due to which there are now more number of cases wherein the cancer is successfully cured. The mammography system is an imaging modality for the proper detection and diagnosis of breast cancer. The system utilizes low dose of radiations for the detection of the disease. There are three types of mammography systems available in the market: analog systems, digital systems, and digital tomosynthesis systems. The mammography system is a non-invasive imaging modality that utilizes a low dose of ionizing radiations to develop images of the body tissues. These images are known as mammograms. Mammography systems are used for early diagnosis of the breast cancer through the advancement of the technology by developing 3-D electronic images from different angles and analyzing breast tissues for presence of cancerous cells in the patient’s body. The systems provide virtual assistance to physicians and provides magnification and light masking flexibility of 3-D images for better diagnosis. Thus, the systems are crucial in decreasing the severity of the diseases and lessening the time of treatment. The advent of the combination technology has transformed the field of mammography by reducing the turnaround time and cost of treatment and enhancing the accuracy, efficiency, and safety during diagnosis and treatment, and also encouraged numerous innovations. The purpose of the study is to gain a holistic view of the mammography system market in terms of various factors influencing it such as recent trends and technological advancements of the market. The scope of this report is centered upon conducting a detailed study of the products associated with the global mammography system market across different regions. The global mammography system market is segmented into four different parts: products, technology, end users, and regions. The global market value was estimated using these three different approaches and was validated with one another. The global mammography system market is expected to reach $3.51 billion by 2028. With the increasing demand for technological advancements in diagnostic imaging across the various segments of the cancer imaging, the mammography system market is expected to witness rapid growth in the future. Further, the swift expansion of the healthcare infrastructure in the developed markets such as the U.S., Japan, Germany, and the U.K. is the key driver for growth of the mammography system market. Moreover, the digital systems sub-segment dominated the global mammography system market in 2017 in terms of products. However, the digital tomosynthesis systems sub-segment is anticipated to witness the highest CAGR during the forecast period. The hospital end users for mammography system witnessed the highest industry demand. Further, the combination technology in mammography systems is expected to witness impressive CAGR during the forecast period. The global mammography system market (by region) is segmented into North America, Europe, Asia-Pacific, Latin America, and Rest-of-the-World (RoW). North America is the leading contributor to the global mammography system market and contributed 37.95% of the global market values in 2017. However, Asia-Pacific is expected to grow at a CAGR of 7.37% during the forecast period, followed by the North America region.